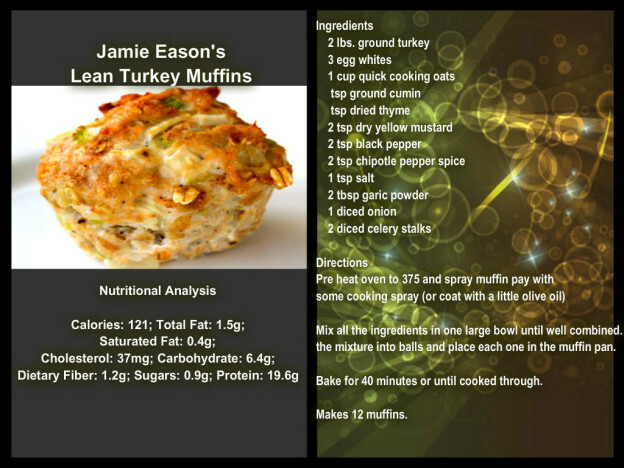 By themselves as a snack or appetizer, or included as part of a lunch or dinner meal, lean turkey muffins are like a turkey meatloaf in muffin form. I make Jamie Eason’s turkey meatballs all the time and wanted to share the recipe with you. Cooking them in a muffin pan is a easy way to prepare lean protein in bulk because muffins are a ready to go part of a healthy meal. The muffin size also helps with portion control! Preheat oven to 375 and prepare muffin pan with spray oil, or coat with olive oil. Mix all the ingredients in one large bowl until well combined. Shape the mixture into balls and place each one in the muffin pan. Bake for 40 minutes or cooked through. I made these today, and was very pleased with the outcome. I served them with rice and veggies and a side salad. The flavor was really nice. I think the Chipotle seasoning was key. I added just a little more to suite my taste. This was a little like making a meatloaf. Making them into individual muffins is really great idea for portion control. I can’t believe they only have 121 calories per muffin! Glad you enjoyed the recipe and the result came out fabulous! I utilize this recipe often in planning and prepping for the week and always having something healthy on hand.